Attention dog and cat lovers! As you may already know, most Ocean City hotels do not allow pets. Rather than leaving your pet at home consider bringing them along and making accommodations for your furry friends at the Dogtel Hotel. Located on route 50 just 2 miles west of Ocean City the Dogtel Hotel is an easy place to stop on your way to your Ocean City hotel. I recently met with Dan, the owner of the Dogtel Hotel, along with longtime employees/dog whispers Cindy and Judy. They both stressed that you have to be cautious and safety conscious to work at the Dogtel. They encourage you to visit your pet or even take them for the day. From May 1 - Sept 30 no pets are allowed on the beach or boardwalk in Ocean City, but there are plenty of places to take your pet for an afternoon or a whole day. Herring Creek nature park at the end of nature park drive is a short drive from the Dogtel Hotel and has a nice looping trail by the bay. Assateague Island National Seashore also allows pets on the beach and makes for a nice day trip. The Dogtel Hotel offers two types of accommodations for dogs, Suites and Runs. The Suites are equipped with lots of space for your pet, carpeted floors, a personal bed and they resemble the look of a horse stable. The Runs are for our more adventurous pets, they are fully enclosed by chain link fence (for dogs that like to jump out of the Suites) and also come with a personal bed. Even though it’s called the Dogtel Hotel, they have an area for cats too, named “Kitty City”. All dogs that stay at the Dogtel Hotel need to have their vaccination records. Reservations should be made at least a couple of weeks in advance and the suites should be booked at least a month in advance during the summer. Dan joked that they often have people calling to make reservations for themselves. “Unless you’re in the doghouse, we can’t help you”, he said. The Dogtel Hotel is celebrating their 10 year anniversary this Thursday, April 5, 2012 and the OC Chamber of commerce is helping them celebrate with a ribbon cutting. Congrats to the Dogtel Hotel! If you make a reservation at the Dogtel Hotel, mention this blog post and get $10 off your pets first night! 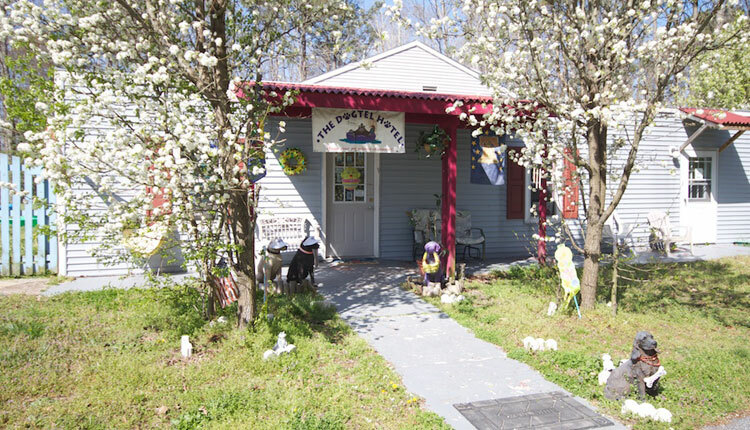 Find out more about the Dogtel Hotel on their website or call them at 877-364-835.